The staff can be used either as a monopod / single stick or a bipod. With a strap it will work as a tripod as well. It will function at its best when the legs are separated approximately 40 - 60 cm. (1,3 - 2,0 ft) at ground level. Let the stick tilt. If possible, let the stick rest on soft soil. With some exercise one can open the stick single handed. Let your hand move down 40 - 50 cm (16 - 20 inches) below the bolt and press the legs away from each other. By placing one finger between the legs and lifting the stick up above the ground, the stick will open by it self. Be careful to open the stick correctly! Upon making, there has been made the best choice possible among materials and dimensions to give the wooden construction both strength and lightness, prerequisite that the user shows consideration and do not let it be damaged. Do not thrust it into the ground, there is a risk that you will hit a solid stone or root and thereby damage the staff. Do not let the barrel have direct contact with the staff. 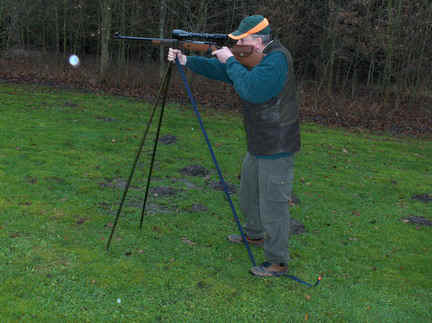 Always place the head of the stock in the U-shaped fork and hold on to the bipod. To change your vertically aiming, move your body back- or forwards. 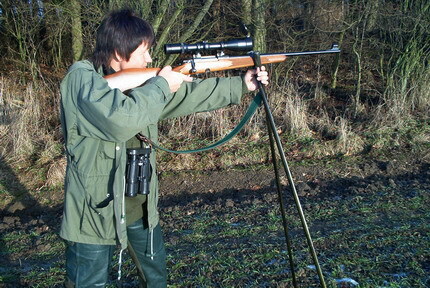 You can change your position easily by lifting the bipod and the rifle at the same time. The bipod will, when lifted, squeeze the head of the stock and hold it in a firm grip. If the game moves you can follow it with the rifle without moving the stick. The stick will twist. Does the game move more then 20 m out of 100 m you should consider to move the stick as well. Please notice that the hunter tilt the bipod to achieve the best rest. 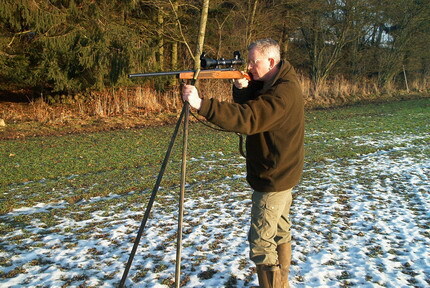 The use of the wooden bipod will especially improve the precision of your shooting vertically and the risk for unwanted low shots diminishes. Low shots are a frequent reason for wounding game. The most accurate shooting is done with the back leaning against a tree, It feels like the sight locks at the target. You can also lean your shoulder against a tree. In this position your sight is locked on to the target. The meat quality enhances because of the higher percentage of good shoots. You can open and close the legs of the bipod silently if you use both hands and restrain the pull of the magnetic lock with your fingers. When using only one hand to open you can hold the tip of the rifle stick between and against your legs as a shock absorber and silencer. Remember to practice both home and on the shooting range. The staff is also a very good companion in rough country and to lean your binoculars onto. Hold tight onto the wooden bipod and keep it under the head of the stock. Never under the barrel! When you put the stick into your pocket it is possible to move freely and follow the game. Most people experience after they have learnt the technique that they are unwilling to go hunting without it. The benefits are greater than the disadvantages. It is better to bring it along and perhaps choose to place it against a tree for a while, than lack it because you do not have one or left it back home. 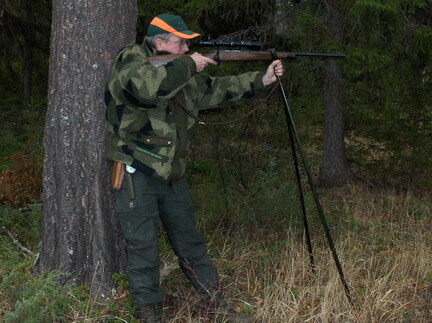 The rifle stick is usually associated with stalking, but it can as well be used on a battue. 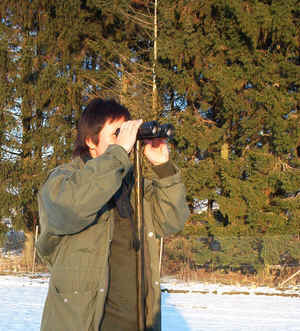 It is difficult to avoid using the staff if you are to have full use of your binoculars. The support you get makes it much easier to spot details of antlers or field signs of a bird for example. The relaxed position is ideal for extensive viewing. Therefore you ought to use a staff made for your own length. Relaxed observer resting the binoculars onto the staff . The sling acts as a third leg. There are rifle sticks with three legs. They are usually used on safaris etc. where you have someone to help you to open and place the tripod in front of you. 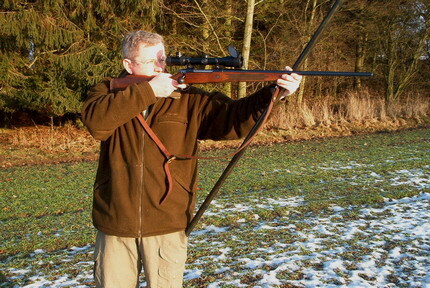 Some marksmen achieve the same effect in a simple way by fastening a strap or sling onto the fork. 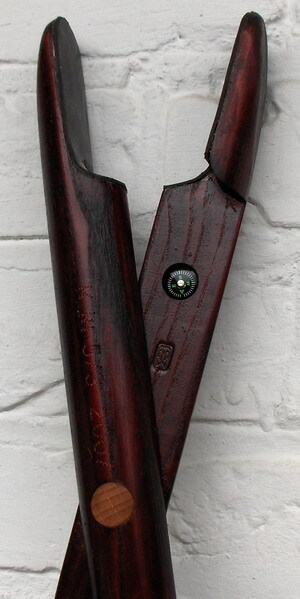 The marksman places one foot upon the strap and holds the bipod straight. Push the bipod away from you. When you slack the strap with your foot you could change the vertical aim. When you have found the correct position you press hard onto the strap with your foot. You will then have support for the rifle both to the sides and forward. The strap weights less than a third leg on a tripod and it can be used when dragging / transporting a deer or as a dog leash. The use of a bipod or even a three legged one, does not prevent the marksman from moving sidewise when firing. The best way to deal with this is to find support for the shoulder or an arm against a solid object while using the bipod simultaneously. Calibre: 30-06 and 7,0 g.
Rifle scope: 6 x 42 mm with a red dot. Left: With bipod and shoulder support. 50 mm. Right: Without bipod or support. 93 mm. When you go for a longer walk it could be wise to put some heavy tape around the tip of the staff to protect it from wear and from splitting upon a branch etc.